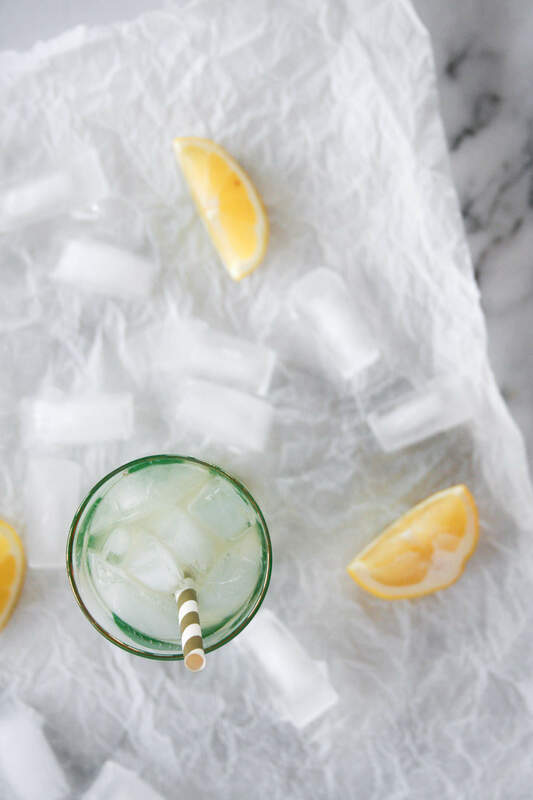 A quick and easy cocktail recipe – made with three simple ingredients, the Bee’s Knees is the perfect light and refreshing drink for a cool spring night. Pat and I were married on Saturday February 15, 2014 in Minnesota. The next day after driving the 7 hours back to Chicago, his brother and I went to the Justin Timberlake 20/20 concert tour. And two days later, I flew to Manhattan Beach California for work. It was really a magical first week of marriage. Kidding. Now there is a little back story to why the schedule shook out that way, but all of those things did happen and it’s something we like to joke about now. But, he was able to join me for a mini-moon in California the following weekend. And it really was a wonderful first week of marriage! While in Manhattan Beach, I had one of my favorite cocktails to date – the Bee’s Knees. I loved it so much that I took a photo of the ingredients on the menu (and yes I had to use a flash because the restaurant was dark and romantic… read: I couldn’t see a thing) so I that could recreate it at home. Little did I know, the Bee’s Knees is actually a very common cocktail (cue the hand-to-face emoji) and could have just googled it. Three years have passed and I am still making it! The key to the Bee’s Knees is honey syrup. Honey syrup is just like simple syrup but you use honey instead of sugar. It’s a simple one-to-one ratio of honey to water in which the honey is dissolved into water, cooled, and stored for future use. And the only song that comes to my mind when I think of the Bee’s Knees is ‘Honey’ by Trace. Never do I condone/approve the consumption of alcohol in an attempt to mask and/or relieve your pain and sadness. THAT BEING SAID, if you’re feeling a little sad because someone didn’t like your photo on Instagram within an appropriate window of time (15 seconds), Honey by Trace is the song for you. And the drink for you is the Bee’s Knees. It’s that perfect balance of refreshing, sweet, crisp and overall deliciousness for those soul searching, philosophical questions like, “Why does the dog freak out at the vacuum?” or “Is that stain on my shirt from lunch….from 3 days ago?”. The song hits ya right in the feels. Trace’s song, Honey, is that friend that asks you 30 times what’s wrong, and you push away, push away, push away and finally open up and say what is really on your mind. Keep The Bee’s Knees….because it is delicious. So apparently if you’ve seen Good Will Hunting, you will get the joke that Pat just made… I haven’t seen it and totally don’t get it, but I hope you do! On another note, how refreshing does that look?! 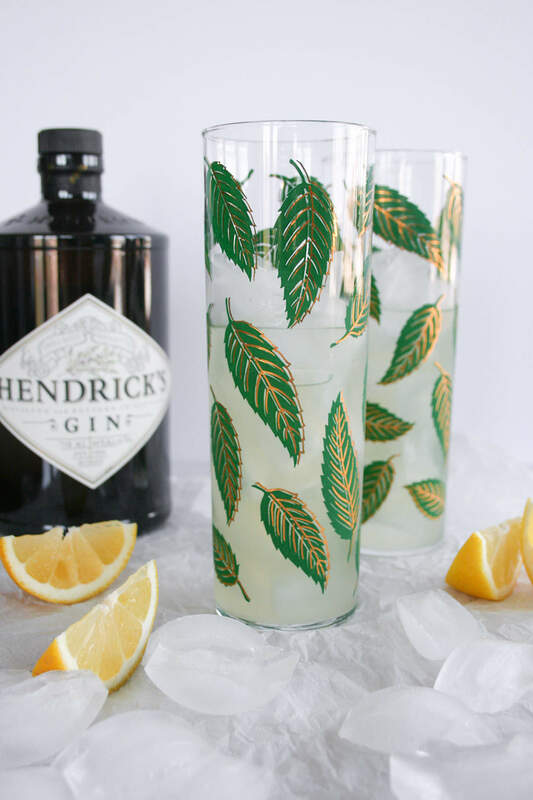 This cocktail is perfect for those spring nights when you’re outside grilling, listening to the birds chirp, and enjoying the company of your handsome husband. Are there any drinks you would like to see on Lyrics & Libations? If you make The Bee’s Knees (and listen to ‘Honey’! ), post a picture on social media and use the hashtag #HBNlyricsandlibations for a chance to be featured! 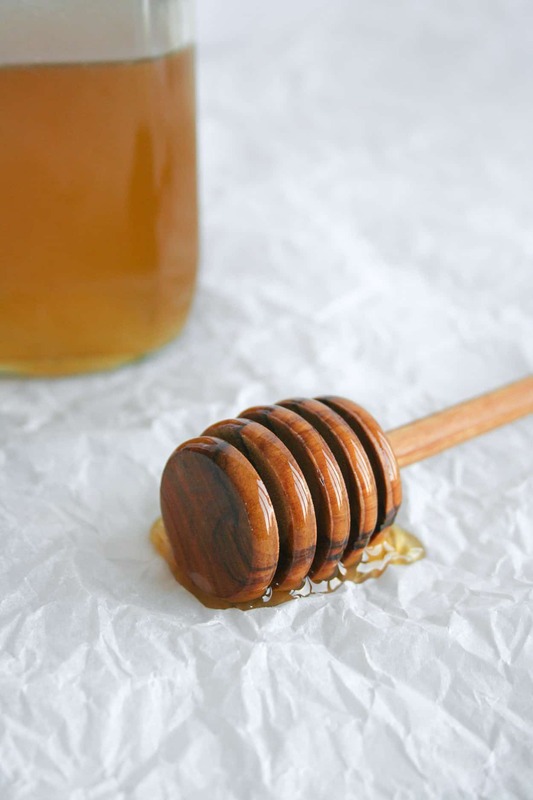 Make the honey syrup: Dissolve honey into water over low heat in a small pot. Let cool and store in a glass container. 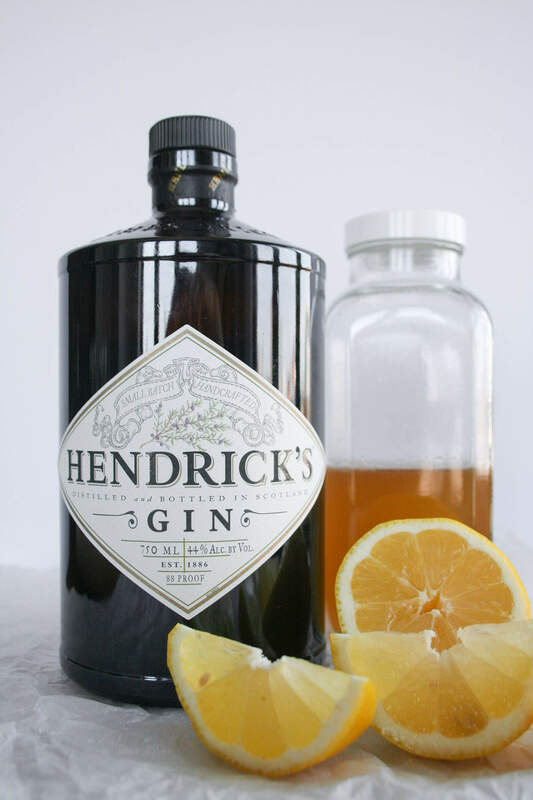 Make the cocktails: Add gin, honey syrup, and lemon juice to a cocktail shaker with ice. Shake well. Strain into two glasses with ice. I love how this has been a reminder of the sweet first week of your marriage. I hope it’s gotten just sweeter and sweeter since then. Will this harden if put in the fridge? It will not! You can treat it just as you would other simple syrup – stored in the fridge or in your cupboard. Thanks Anna! Oh I love gin, never used to but I feel the older I get the more I like it! kinda like prosecco! your first week of marriage sounds much like ours – straight back on a plane to America, then back to work ? but next month we are finally going on our honeymoon! 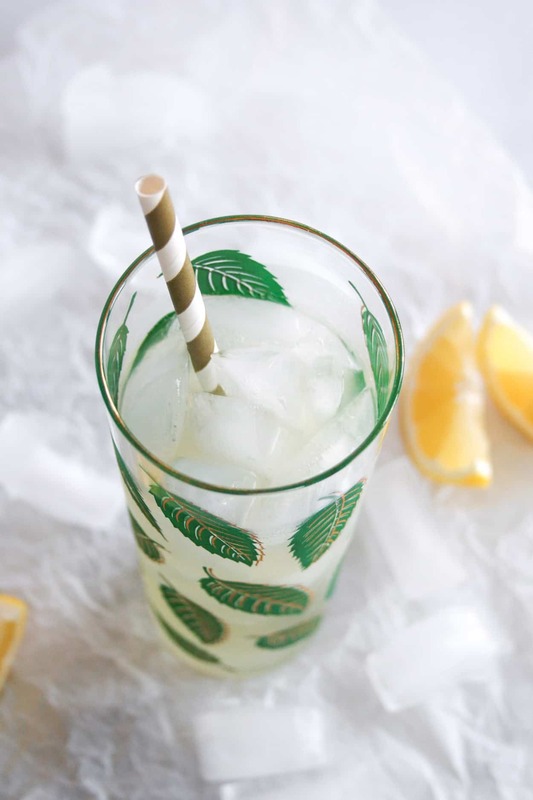 this cocktail looks fab, def have to try it! Thanks Georgie! Where is your honeymoon?! We’re heading to Mexico (playa del carmen) and fingers crossed Havana, Cuba for a week in each! I am SO excited!!!! How fun!! Hopefully sunny Mexico will be a nice reprieve from the rain in Portland!